For active adults looking to right-size their home, a move is the ideal time to reduce clutter and prioritize the things that are really important to you. Getting rid of unnecessary stuff the can be therapeutic, but planning out your decision-making can make the process a little easier. Here are five tips that can help you decide what to keep, give away or toss out: Make a list of the things can't live without This will help you let go of the things that don’t make the list. Make sure everything has a purpose. Clothes you haven’t worn in more than six months can go, along with books you haven’t read in years or furniture that won’t fit in your new home. Remember, if you haven’t seen it in more than a year, you probably don’t need it. Make it digital CDs, DVDs, cassettes, videos, pictures, and important documents can all be digitized and saved to a hard drive or the cloud. You’ll be amazed how much space all that old media can take up. 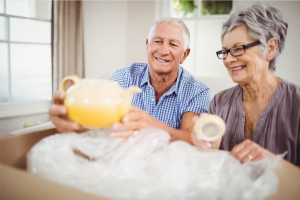 Make presents of family heirlooms and sentimental items While you may not have space for everything, your friends and family might like to have some of those keepsakes. You get to watch your loved ones enjoy items that are important to you and you reduce the chances of squabbling over those items later. Make a plan for the discards Separate the things you must have from the things you want to have and the things you don’t need. Then decide what can be donated, what can be given away and what should be thrown out.